Do you know that you are right in the middle of a war? If you didn’t know, let me be the first to tell you: “You are right in the middle of a war!” There now. You’ve been told. This is not a regular battle for land or oil for example. No. This war is for our very souls. Of course, this makes it the most important battle EVER to be fought. During a battle for land, the land can exchange hands several times in the same battle. The most insignificant land can become critical in a battle. Then after the battle is all over, that particular piece of land that so many were killed over becomes meaningless and typically forgotten. Oil wells also dry up and are no longer useful. The battle for souls is different. It is different because the soul is eternal – everlasting. I’ve heard some people think that when they die, they will simply no longer exist. Those people are misinformed, ignorant, in denial, or exhibiting wishful thinking. This form of belief is contrary to what the Bible has to say. The Bible states that people will either end up in heaven or in hell. Now we didn’t exist before we were created. But now that we have been created, we will not be “un-created“. The soul is eternal. So the question is: What happens when our bodies die? The Bible states we will go to heaven or hell. One or the other. It’s not complicated. Heaven or hell. Now, when Satan sinned in heaven with pride (Satan being a created being, an Angel, himself-tried to make himself God), about 1/3 of the angels (It is estimated that approximately a third of the angels fell based on Revelation 12:4) followed him. When these angels fell, they became known as evil spirits or devils. Evil spirits, devils, demons-we’re talking about the same beings here. Actually, let’s get these various names out of the way right now. I realize that some people are going to say to themselves, why isn’t he mentioning the Nephilim? Why does he call them “demons” when the King James Version calls them “devils”? 1. These beings are EVIL to the core (varying degrees of evil). 2. These beings are UNSAVED and destined for the lake of fire. 16 And the result of God’s gracious gift is very different from the result of that one man’s sin. For Adam’s sin led to condemnation, but God’s free gift leads to our being made right with God, even though we are guilty of many sins. We live in a fallen world. Satan is the ruler of this world currently. Don’t get me wrong, God is in complete and total control. 21 The time for judging this world has come, when Satan, the ruler of this world, will be cast out. Think of it this way, God keeps Satan on a leash and will only let Satan go as far as what God will allow. Here is the Good News: Thank God for Jesus Christ! Jesus Christ (Who came as God in the Flesh -fully God and fully man -therefore: God-Man and the Son of God, who is part of the Holy Trinity) defeated Satan on the cross.Therefore, although many battles are fought along the way in our individual lives, we know that Jesus Christ has won the war. We already know well in advance that Jesus IS victorious. We know that Jesus is victorious because when Jesus rose again from the dead. He ascended into heaven to be seated at the right hand of the Father. Therefore, His sacrifice was accepted as payment for our sins. When Jesus followed God the Father’s will- to willingly shed His precious blood on the cross for our sins, Jesus took the sins of the world away. God the Father chose the method of salvation to be determined by “FAITH” in His Son-Jesus Christ. Not by our works but rather trusting in Jesus and what Jesus has already finished. Here is the Bad News: Not everyone accepts Jesus as their personal Savior! God does not want mindless robots, so we have our free will to accept or reject Jesus. Jesus made the payment for every one’s sins, but not everyone will accept it. I’ve heard a good example mentioned somewhere before: It’s like Jesus made a deposit into every one’s bank account-but it’s no good if a person doesn’t go to the bank to receive (faith) the deposit (100% free gift). Let’s take a look at the overall picture. Satan sinned and created a rebellion in heaven. Approximately 1/3 of the angels in heaven decided to follow Satan. Satan was cast out and is currently the ruler of this world with limitations on him set by God. The angels that followed Satan became fallen angels (or evil spirits, or devils, or demons etc). When humanity (Adam-again, because Adam was the first human-Eve was created FROM Adam’s rib) sinned, we are all literally born with the sinful nature thus “bent-away” from God. We are guilty of our sins and deserving of hell due to breaking God’s Law. Because of this sin, humanity’s relationship with God was broken. God the Father still loved the world, and chose to save those who believed on His Son Jesus-God the Father chose the way to restore the broken relationship-through faith in His Son Jesus. As the Scriptures say, “No one is righteous–not even one. It is ALL about what Jesus has done – No works on our part, just faith. We receive Jesus’ righteousness by faith. A believer is declared righteous before the Father NOT based on the believers’ own righteousness – but rather Jesus’ righteousness! Jesus came to earth as God in the flesh, born of a virgin, was crucified, died and was buried. On the third day He rose from the dead. Jesus fulfilled God the Father’s will, thus took away the sins of the world by the shedding of His precious blood. Satan and the demons were defeated and awaiting judgment – they are destined for the lake of fire. However, they currently still have some room to move – depending on what God allows. Therefore, we are all in the middle of a battle between good and evil. Heaven or hell. Jesus made the payment IN FULL so that nobody has to go to hell – God chose the way to receive Jesus’ payment is through a child-like faith and trust in His Son Jesus. Now, Satan knows where he is going and so do the devils. Humans are made in the image of God. Satan has been defeated and cannot directly hurt God. What does he do? Satan wants to destroy the next best thing- us! So far, what I’ve very briefly written is a short history of how we are in this current state. 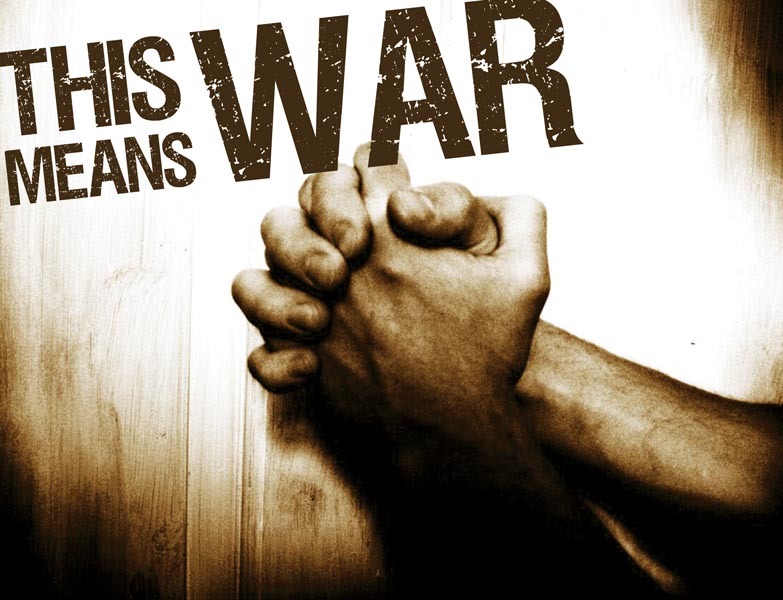 The next article to follow will focus more of the practical side of Spiritual Warfare. ALL OF THE GLORY AND HONOR TO THE LAMB OF GOD WHO TAKES AWAY THE SINS OF THE WORLD. CALL UPON JESUS AND RECEIVE HIM AS YOUR SAVIOR RIGHT NOW!